When Yann de Rochefort opened the first Boqueria 10 years ago, he was having trouble finding a fun tapas place that offered a menu based on culinary ambition. So, he took matters into his own hands. He opened Boqueria, and his restaurant has been bringing the taste of Barcelona to New York City for more than a decade. 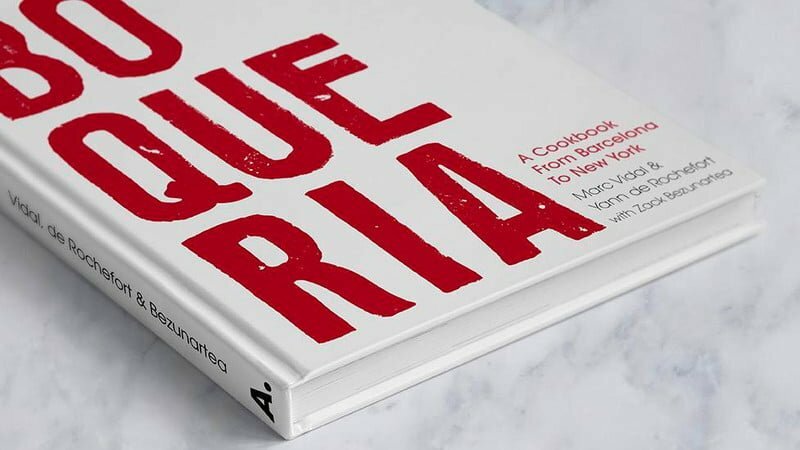 This year, the team is celebrating the decade milestone with a fifth restaurant in Midtown West and the release of Boqueria: A Cookbook from Barcelona to New York. Now people can get a taste of beloved Spanish cuisine at home. There’s a nightly liveliness at Boqueria’s original 19th Street location to this day. As the after-work crowd descends on the eatery, you can see Rochefort’s vision for the joint come to life. Rochefort was inspired to open tapas restaurants after he fell in love with Barcelona’s dining scene while living and working there. And the appeal makes sense. You feel a sense of freedom in Barcelona’s tapas bars — you can try a bunch of small plates instead of committing to one large dish, people stop by for a drink and a bite and go as they please. There’s this constant flow of energy that many restaurants will try for years to replicate. Boqueria’s chef, Marc Vidal, started working in his family’s Barcelona restaurant, Bar Roca, at age nine. Despite warnings from his grandmother about choosing the chef career path because of the long hours, he decided it was his dream and pursued cooking school. He’s done time at incredible establishments around the world, including L’Arpege and Restaurant Alain Ducasse in Paris, as well as Ferran Adria’s El Bulli on Spain’s Costa Brava. 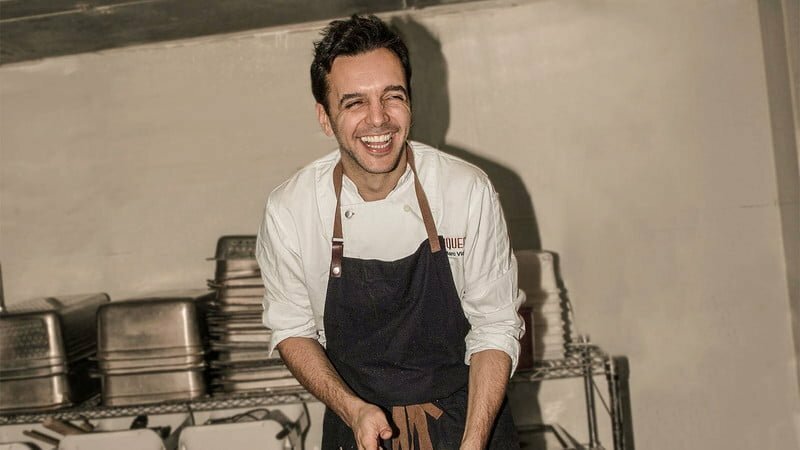 He fell in love with Boqueria while visiting NYC (he was working as an executive chef in Miami at the time) because he felt it was the first time an American restaurant captured the energy of Spain. Half a year later, he became Boqueria’s executive chef. Boqueria takes its name from Barcelona’s Boqueria Market, an expansive network of stalls and food vendors that has remained the same for hundreds of years. Chef Vidal and his team shop at New York’s Union Square Greenmarket, which provides inspiration and fresh produce for dishes. While he still cooks with classic Spanish tapas in mind, these local flavors and ingredients always inflect their influence on the menu, giving Boqueria’s brand of tapas a unique spin from what you’d find overseas. But the easy-to-share plates always have the same end goal in mind: to inspire conversation and connection. The Boqueria cookbook is divided into 10 sections that make it easy for the home cook to navigate. The first is “The Classics,” where you’ll find a lot of recognizable tapas fare, dishes like montados de anchoas (salt-cured anchovies and eggplant on toast) and patatas bravas (fried potatoes with spicy tomato sauce and allioli). There are sections dedicated to salads and eggs, and a chapter for creative vegetable dishes like calabaza con sobrasada, roasted acorn squash with crumbled pork sausage. The “Rice and Noodles” chapter is small but mighty with a couple paella recipes and two other unique dishes. 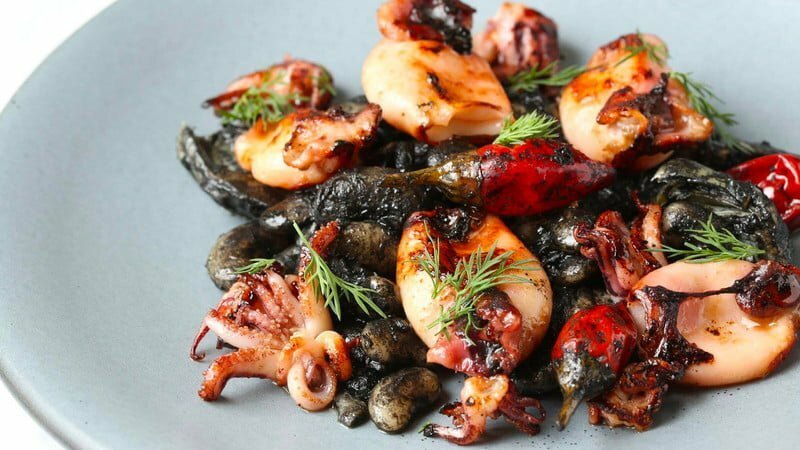 There’s a whole section dedicated to seafood with everything from crudo de lenguado con pirirrana (cured fluke with tomato-pepper vinaigrette) to sepia con beicon y lentejas ahumadas (seared bacon-wrapped cuttlefish with smoked paprika lentils). “Meat and Poultry” features mouthwatering dishes like carrilleras de credo, braised pork cheeks that are cooked with white wine, cabbage, mushrooms, tarragon, and mustard. There are sections for cocktails and bases, which contains a lot of the sauce recipes for other dishes in the book. And, of course, the “Desserts” chapter ends things on a sweet note with treats like tarta de chocolate con nueces y cafe (chocolate tart with walnuts and coffee cream) and flan casero (vanilla-coffee custard with caramel). 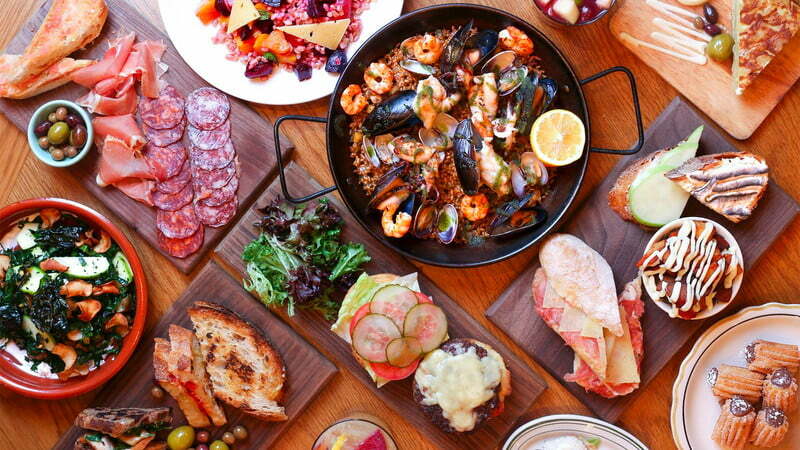 Tapas is all about sharing food with family and friends. 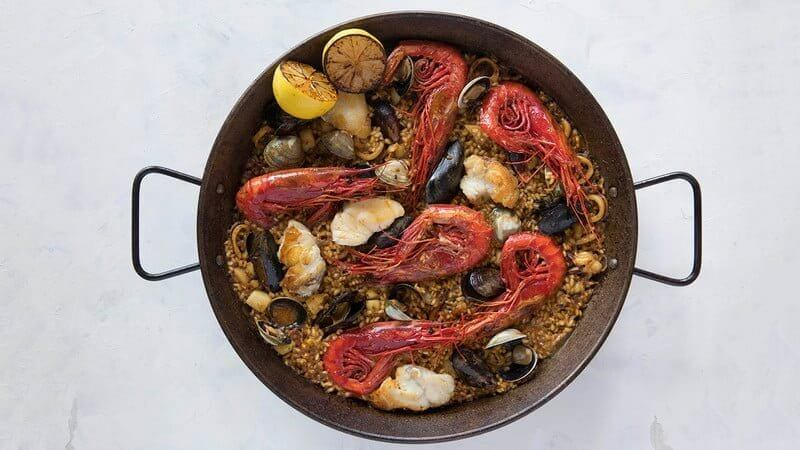 As noted in Boqueria, “it is a time-honored, informal, and genuine way to connect: the original social network.” With Boqueria, you can bring this same energy and togetherness to your home table with its thoughtful, fun, and, best of all, shareable recipes. If you want to give the cookbook a spin, we’ve included the recipe for escalivada, a dish composed of charred eggplant, peppers, and onions with labneh. Preheat the oven to 450 degrees Fahrenheit. Heat a grill to high. If you haven’t got a grill, set a wire rack over a gas burner and turn the flame to high. Place the onion on a foil-lined shallow baking pan and roast until burnt outside and collapsed, 40–45 minutes. Leave to cool to room temperature. 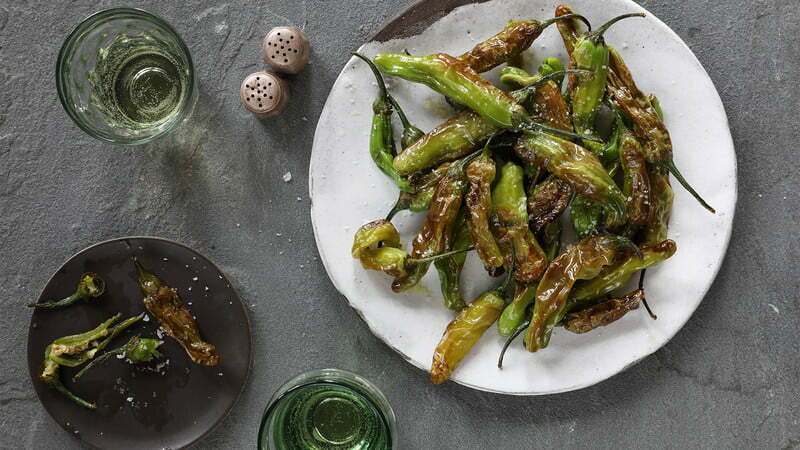 Meanwhile, turn the peppers and eggplants on the grill — or on the wire rack — until completely charred and smoky, 6–8 minutes. Transfer the peppers to a bowl, cover with plastic wrap, and let stand until cool enough to handle, 10–15 minutes. Letting the peppers steam in the bowl will make them easier to peel. Transfer the eggplants to a plate and let stand until just cool enough to handle. They will be easier to peel when warm. Discard the outer burnt layers of the onion, then cut into 1/2-inch pieces. Pull the peppers in half, discard the stem, seeds, and ribs, then rub off as much of the burnt skin as possible. Cut into 1/2-inch pieces. Discard the eggplant stems, then gently peel off the burnt skin. Cut into 1-inch chunks. Put all the vegetables in a bowl, drizzle generously with oil and lightly with vinegar, and sprinkle with salt and pepper. Gently toss, then adjust the seasonings to taste. 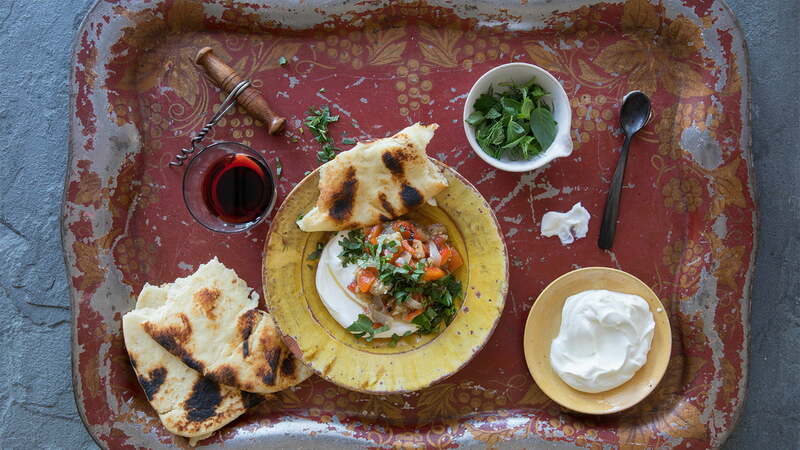 Spread the labneh, or yogurt, on serving plates. Top with the escalivada and herbs. Sprinkle with Maldon salt flakes and drizzle with oil. 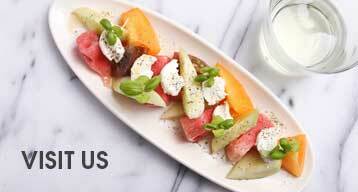 Serve with warm pitas or naan bread. Because Japanese eggplants are long and slender, they take on smoky flavors much more readily than large, squat eggplants. They’re also less likely to be bitter, which makes them especially suitable for this dish. When peeling the charred skins off the red peppers and eggplants, avoid rinsing them. The water would dilute the flavor you’ve just concentrated over the fire. It’s OK if there are some blackened bits left after peeling. Labneh is available at Middle Eastern and specialty markets and many supermarkets. If you can’t find it, refrigerate plain Greek yogurt in a mesh sieve sett over a bowl until it’s almost as thick as cream cheese, about a day.